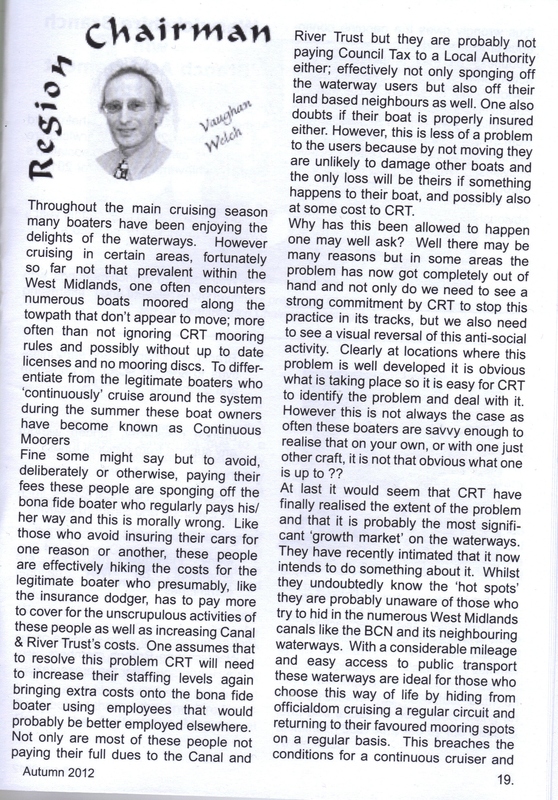 “CRT… are probably unaware of those who try to hide in the numerous West Midlands canals like the BCN and its neighbouring waterways. With a considerable mileage and easy access to public transport these waterways are ideal for those who choose this way of life by hiding from officialdom cruising a regular circuit and returning to their favoured mooring spots on a regular basis. 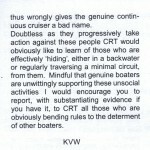 This breaches the conditions for a continuous cruiser … Mindful that genuine boaters are unwittingly supporting these unsocial activities… I would encourage you to report, with substantiating evidence if you have it, to CRT all those who are obviously bending the rules to the detriment of other boaters”. 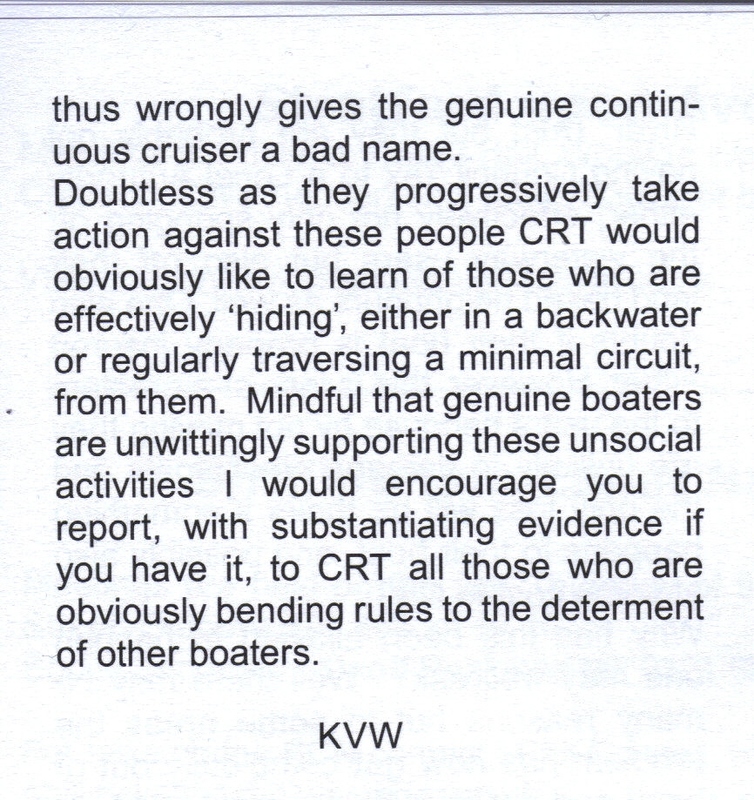 It is perfectly legitimate for boaters without home moorings to follow the travel pattern Mr Welch describes; Section 17 3 c ii of the 1995 British Waterways Act does not specify a minimum distance or prescribe any particular travel pattern. The BCN and its neighbours are a dense network of hundreds of miles of canals. It beggars belief that anyone thinks that travelling a ‘considerable mileage’ on this extensive network of waterways is not bona fide use of a boat for navigation. The IWA has lost the plot completely! Of course,if boaters are staying longer than 14 days in one place without it being reasonable in the circumstances, they are on the wrong side of the law. 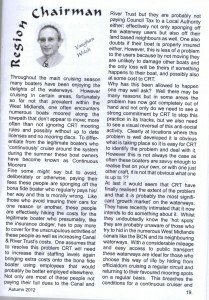 But that is a civil matter between the boater and CRT, and it is nobody else’s business. It is not a criminal offence, so witnesses are not obliged to report it. Vaughan Welch also accuses boaters without home moorings of avoiding Council Tax. This is completely inaccurate. Council Tax is levied on domestic property and so cannot be levied on a boat, because a boat on its own without a mooring is a chattel in law and not property, even if it is somebody’s home. Paying Council Tax is not a requirement for using local authority services; many people do not pay Council Tax and yet still use local services, because they qualify for Council Tax Benefit. If you see anyone who appears to be watching your boat, photographing it or taking its number who is not a CRT employee, they could be committing an offence under the Protection from Harassment Act 1997. This offence is often referred to as “stalking”. You can report suspicious activity to the Police on 101; calls are free. You can read the full article in the Autumn 2012 issue of ‘Navigation’ below. This entry was posted on Sunday, January 13th, 2013 at 7:17 pm	and is filed under Continuous Cruisers, Mooring, News, Opinion. You can follow any responses to this entry through the RSS 2.0 feed. You can skip to the end and leave a response. Pinging is currently not allowed. Calls to 101 are not free. They are 15p per call. I would love the geographical number of my current local police switchboard. I have to disagree with Granny Buttons, Yes I am a ccer, I also work and run a Business. I am not eligible to pay council tax because of my itinerant life style. Council Tax is not the only source of revenue for a council. They are provided with money which comes from government. Government gets its money from taxation. I pay VAT on all goods I purchase in that area and also support the local economy buy buying locally. I pay income tax and NI this pays for NHS and other local services such as the police and fire brigade. My CRT licence pays for the rubbish collection, sewage disposal and water that I use on the system. And it could also be argued that I am indirectly paying council tax via the licence since CRT have to pay business council tax on all its properties. This article from the IWA is divisive and downright shocking in its discrimination. I am deeply disturbed that this individual is on the C&RT council and I think he should resign. I can see why many of the things he says in that article are contentious, but Vaughan Welch is correct when he says many liveaboard boaters are ‘…probably not paying council tax’. He doesn’t say ‘avoiding’, you do; but he does say (a very loaded term) ‘sponging off’. I am a continuous cruiser myself, and don’t pay council tax because like most liveaboards I’m not registered for any one council. However, I am acutely aware that council tax pays for many social services that society and boaters rely on – including local schools, the police and the fire brigade (who we expect to come to our rescue if our boat goes up in flames). So it does seem reasonable to me that, as a simple moral point, we should be willing to pay at least some of that tax voluntarily – just as we’d expect a multinational to pay its fair share. Sponging is a nasty word, but I bet there’s a nicer word we can agree on.